I've been a member of the Fibre Artists group with a stand at the historic Cargo Shed on Tauranga waterfront for over a year now. There are quite a few of us sharing the fibre stand so I only have to work three days a month. Even with the hour long drive its a fun day out with lots of people to meet and talk to. 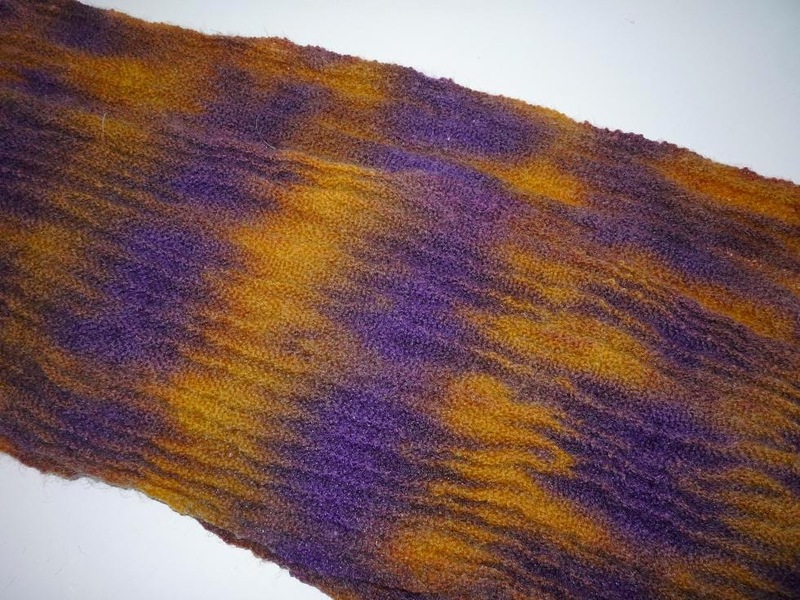 My stock was getting low so I wondered what I could do with this purple and gold shibori scarf to make it more attractive to a wider audience. After a good soaking it went into the dye pot with half a teaspoon of royal blue acid dye and I was very pleased with the result, especially as it held its texture. This is woven in slightly overtwisted merino which, when first wetted out, it would have released its twist at the peek of the pleats thus making them permanent. I was wondering why I didn't have more weaving to talk about but its been so frantic here at Hotel Pio that I forgot to take photos of the last blankets, a lovely mix of light taupe which reminded me of driftwood. Have also finished 5 metres of fabric for speaker cabinets - photos to follow after it has been gifted. On the house keeping side, remember back at the beginning of August, I ripped my leg open and got seven stitches. I can now report I took the last dressing off this morning. It is healed at last. Yippee! Jack was delighted with his Tardis socks (last post) - made great skid-mobiles on the varnished floor. And just a reminder that if you want an easy notification that there is a new post there is an Email button at the top right of this page. It would be nice if you also joined the list of Followers so I know some folks are interested in my ramblings. For a couple of months I was driving 8 k up and 8 back to the doctors surgery to have the ulcerated wound dressed twice a week. Such a relief when they said I could do it myself. That merino should have the same effect. Can't remember if I gave you the first batch or second. 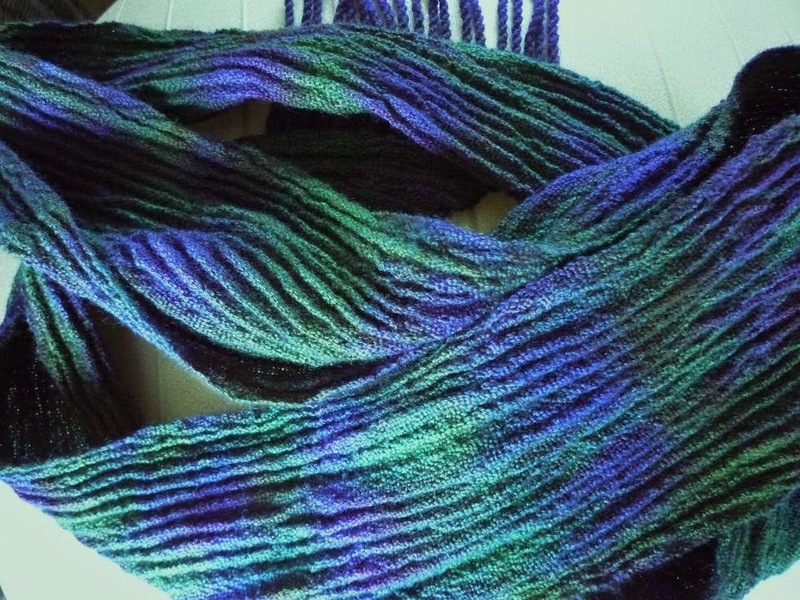 If not enough for complete scarf use it in the weft.